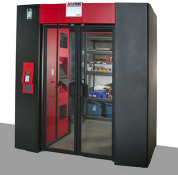 Source: AutoCrib, Automated Inventory Systems, Inc.
AutoCrib IntelliPort becomes the employee ID-controlled doorway into and out of an existing stores area or tool crib. AutoCrib IntelliPort becomes the employee ID-controlled doorway into and out of an existing stores area or tool crib. The IntelliPort RFID portal records transactions by reading Gen-2, Class 1, Passive RFID tags which are affixed to any number of items. These tags are automatically assigned by the included RFID printer just before being applied to the item. IntelliPort's turnkey system of RFID readers scans items to be issued or returned, making check-in and check-out fast and easy. The system checks out items based on a unique serial number for each item (so there's less dependence on correct bin location). AutoCrib, Automated Inventory Systems, Inc.